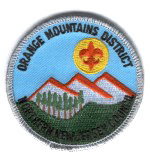 The Orange Mountains District's Roundtable meets the second Monday of each month. Topics for July: The Sierra Club demo on environmental service projects, Eagle projects, hike prep & outings. October 2003 -- Carol Platt -- Guest: Vera Bennett for Health & Safety. Travel west on Northfield Avenue into Livingston. Make a right turn onto Livingston Avenue. Travel north on Livingston Avenue. After you pass the Livingston Library on your left and the Police Station on your right, look for the Grace Lutheran Church on your left. Park in the rear. Travel west on Route 280 to exit 5A onto Livingston Avenue. Travel south on Livingston Avenue. You will cross Mt. Pleasant Avenue (Route 10). Just past the 7-Eleven, look for the Grace Lutheran Church on your right. Park in the rear.